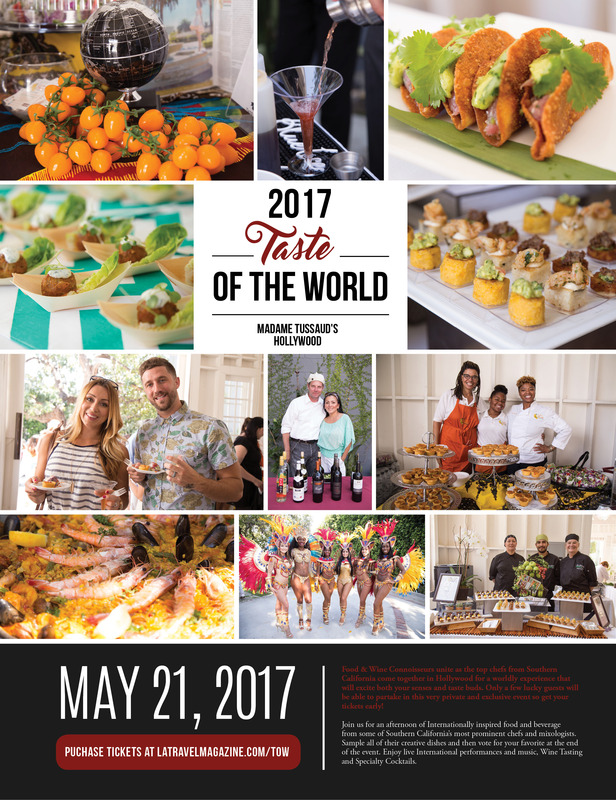 On Sunday, May 21, 2017, food and wine connoisseurs will unite as top chefs from Southern California come together in Hollywood to celebrate food, wine and culture inspired by international travel, at Madame Tussauds on their 6,000-square foot Starlit Rooftop Terrace for the Taste of the World 2017. Guests will sample small bites of creative dishes featured that afternoon and then vote for their favorite at the end of the event in a top chef style battle. During the afternoon, guests will have the opportunity to take part in a special Around the World Wine Tasting presented by Quintessential Wines and Mixologists will be on-site creating exciting signature creations. Guests will also enjoy live international performances and music by DJ D-dub throughout the afternoon with a special surprise DJ performance and special guest appearances from Witney Carson from Dancing With the Stars, and much more! Upon arrival, each guest will be entered to win an array of prizes including a Grand Prize Luxury Getaway to Cabo San Lucas, Mexico. Purchase tickets for Taste of the World 2017 here and use the code DISC20 for 20% off!